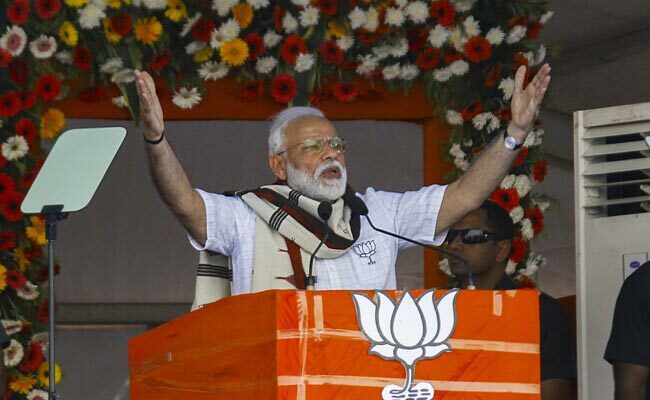 Lok Sabha Elections 2019: Kicking off his campaign for simultaneous Lok Sabha and assembly polls in Odisha, PM Modi said the subsequent governments in the state have betrayed its people. Accusing the ruling BJD in Odisha of being "insensitive" to the plight of the poor, Prime Minister Narendra Modi Friday asserted that a "double-engine" government of the BJP at the centre and the state will ensure speedy development in the state. Kicking off his campaign for simultaneous Lok Sabha and assembly polls in Odisha, PM Modi said the subsequent governments in the state have betrayed its people. In a scathing attack on the Naveen Patnaik government, a departure from the usual practice of going soft on the ruling party in the state, PM Modi said: "Both the Congress and the BJD have betrayed the people of Odisha. Now it's the time to punish them and bring in a double-engine government of the BJP at the Centre and the state to build of a ''new Odisha''." The Prime Minister, who began his speech in Odia to strike an emotional chord with the people, said the state government has not been "cooperative" with the centre, as a result of which the poor were deprived of benefits of several welfare schemes such as Ayushman Bharat and PM-KISSAN. "This is an insensitive government. Had it been thinking about the welfare of its people, it would have implemented the Ayushman Bharat health scheme and the PM-KISSAN scheme," PM Modi said, alleging that state government "chose political interests over development". He also pointed out that the state has about Rs 6,500 crore in District Mineral Foundation, of which it could spend only Rs 1,000 crore. The remaining funds are lying in the government coffers, he stated. The PM also charged the state government with "giving a free hand to mines mafia and chitfund looters". "Should you not punish this government? Don't you deserve a change for the better. I want to tell you that this is your opportunity to bring about that change," PM Modi said, calling upon the people to vote for the BJP in both Lok Sabha and Assembly elections and give the party a chance to do ''chowkidari'' in Odisha. The PM and his partymen have launched the ''Main Bhi Chowkidar'' (I too am a watchman) campaign to blunt the Opposition's, especially the Congress's, ''chowkidar chor hai (watchman is a thief) slogan. Asking people to have faith on BJP, PM Modi said, "Chowkidar sajag achi (watchman is vigilant)". Odisha is rich in resources with vast stretches of forests, long coastline, plenty of mineral reserves and ancient monuments, but people here has remained poor over the years due to lack of political will on part of the ruling parties to bring about development. "It takes 10 minutes for the BJD government to walk 10 steps," he claimed. Highlighting his government's achievements in Odisha, the PM said, "The NDA has been working hard to develop road and rail infrastructure in the state. There is no dearth of funds when it comes to development work in the country. "In the last five years, the central government has been able to build homes for eight lakh families, light up 3,000 villages and provide gas connections to 40 lakh homes," he added. Election to 21 Lok Sabha seats and 147 Assembly seats in Odisha will be held simultaneously in four phases - on April 11, 18, 23 and 29.